You can use a release of liability to allow your business to be released from responsibility for any injuries or damages sustained by a participant in an activity either owned or sponsored by the operator. You'll want to use a release of liability template if you own a business and want to reduce your liability, or if you are interested in seeking temporary authority to seek medical emergency information for your patrons. Get started Start Your Release from Liability Template Answer a few questions. We'll take care of the rest. 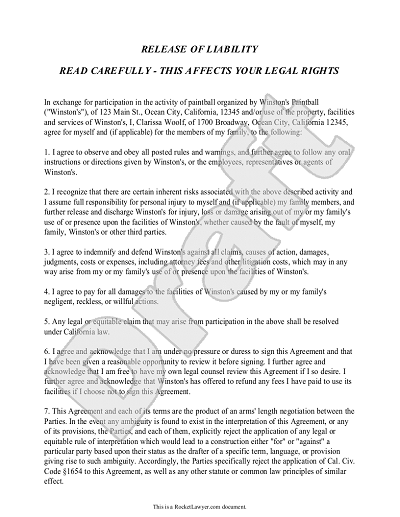 The release of liability template depicted below issues the agreement of Clarissa Woolf to release Winston's Paintball of liability if she is injured during the game. Sample Release of Liability Template. To create your own personalized release of liability template, click on the image above. Most release of liability forms look similar to this release of liability template. It's important to note that the release of liability document can alter one's legal rights, so you should take time to read it carefully before signing. Want to get started? Simply click on the link below to start your release of liability template. Rocket Lawyer also has several articles on related topics, such as How to Appeal a Medical Claim Denial, How to File a Medical Claim, and Get Free Legal Help with Business Formation and Starting a Business.